The Tone Shaper guitar switching board looks outrageous and wonder what it's all about! But this board can literally transform your guitar! I was introduced to the Tone Shaper module boards by a friend on the internet (hello Thomas) who was raving about a new board designed to replace the archaic (some would say) wiring and tone pots fitted to your average Fender Stratocaster and Telecaster. They do make boards for other guitars but you will need to check their site for those as we are specifically looking at stratocaster and telecaster units on this review. So, if you're no expert on wiring and can't solder anything then the Toneshaper board might well be for you. 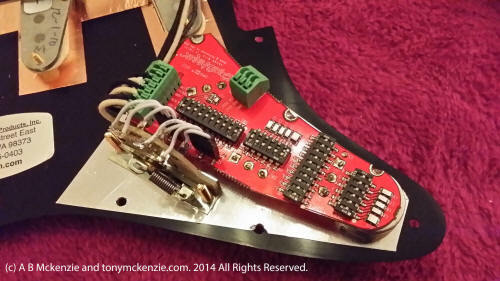 The main board comes with everything you need to get your guitar updated without ANY soldering or messing about... and the instructions are really easy to follow. The maker offers support for custom changes too. Can this board be the answer to tens of thousands of guys who dearly want to modify their guitars but don't have a clue of how to do it and would otherwise have to take the guitar to a technician? Read this no holds barred and completely independent review coming up presently on this website to find out if the Toneshaper is for you. This review is coming presently to this site so watch for the updates on my news page.